@Rehan - Correction: The production Duster AWD models do not come with the AWD stickers on the sides, so there is no question of wear and tear there. The 4WD moniker in the rear is the only one announcing this drivetrain. Excellent review and cements my opinions as well, now that I am a proud owner of this newest beast. It's been about 5 days since I took delivery of the Duster AWD RxZ variant and I should admit, the experience is just fantastic. Graduating from a petrol MS SX4, into the elite turbo diesel territory is quite exhilarating. Almost negligible turbo lag, short gear ratios, steady steering and smoothness makes it a pleasure to drive. Yes, starting from 2nd gear is almost always effortless. Interiors as reviewed here, is a mixed bag. The arm rest by the driver side window is hard plastic and so are the cheap plastic feel of some of the buttons. The instrument console is big and bright and almost in your face owing to its 3D like pop-out design. The information displayed in the digital console is super useful, especially the average mileage and remaining kilometers until empty. The console also displays a useful gear shift indicator which could be quite handy to a beginner. The central console housing the MediaNav system is nice, however the touch screen could have been adjustable (think airplane touch screen) or look-up in an angle for a better viewing experience. Wish the seat adjustments were electronic, I am still lazy to explore the various seat adjustments . The little spaces in the dash are definitely welcome considering the hoard of stuff we carry along these days, sunglasses, mobiles, et al. The glove box is deep which is extremely useful. The placement of some of the buttons is ridiculous, like the ORVM joystick control and the drivetrain selection knob. Moving towards the exterior, the thing that hits one on a profile view is the anthracite alloys, they look just great. The door handles and ORVMs don't come matching body color, which could be an eyesore initially. Probably the best thing about this SUV is its car-like drive feel, makes it all the more practical as an everyday commute vehicle. That being my primary use and the frequent long drives that we take, Duster fits in perfectly. The soft clutch is never a strain on your legs compared to other hard clutch variants. The NVH is definitely not a deterrent as described in this review but the wind noise through the windows is definitely bothersome at high speeds. Overall my initial experience is extremely positive and shall fill in with more pointers as the days go by. 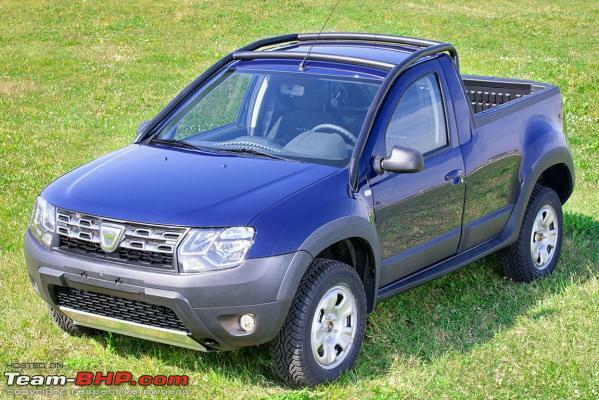 Check out this Dacia Duster mini Truck! Very interesting, produced only in 500 numbers. Last edited by Rehaan : 30th October 2014 at 17:45. Reason: Uploading image to the server itself. Negative for me now. I want my to be SUV to be SUV-like to drive. Any more pictures in reserve, please share. Are you looking forward to buy this, to replace your Safari? No, I am not. Nothing can replace my Safari. The white elephant is special. LOL, I have noticed this with a lot of Safari owners, there just aren't too many cars out there which will inspire them to disown their tata. Its such a paradox considering the image tata cars carry, especially the Safari. A friend is taking delivery of a Duster RxZ AWD version tomorrow and seeks inputs / suggestions / recommendations for All Terrain (A/T) Tires for his new ride. P.S. - He wants to retain the OEM Alloy and is not looking for an upsize. Last edited by vikash49 : 21st October 2014 at 13:28. That's such a shame! The A-W-D looks lovely. Not available even as an accessory? Yeah, I agree! I have checked if it is available as an accessory, but at least the website does not carry that as an optional accessory. Its just a sticker, can be procured from any sticker cutting shop. However, its better to get it custom cut on vinyl based sticker with a clear coat on top once stuck properly. That way it will last forever without any hassle. Except the interior plastics and the missing bottle holders in the rear doors the rest would be acceptable to most I feel. Renault should've really reworked their plastics as now their car is costing 16+lacs OR. Welcome to TBHP! And wish you unlimited safe & happy miles with your new Duster! Note that we have a 2 smiley limit per post. So please refrain from using more than 2 in one post. The post will get moderated sooner or later. Most won't use the word "only" for the two things you mentioned to be different . Sure thing! Please post one soon! Last edited by Reinhard : 22nd October 2014 at 16:37. Mod note: Post Edited. Smiley usage is restricted to two per post on Team-BHP. Please do NOT use more than 2 smileys in a post. We advise you to read the Forum Rules before proceeding any further. Please avoid typing with excessive dots.........like................this. Just became a proud owner of 110 ps Adventure Edition Amazon Green Beauty 2 months ago and enjoying it to the core . That time the SE did mention the upcoming AWD model to be launched in a months time but I decided against it (and am happy about it now) after he mentioned the approximate on-road cost of AWD at ~16+ lakh!! which frankly to me dint justify it in value after I recently TD it. Lookwise I think the Adventure trim looks the best yet among all the Duster variants. The driving dynamics of the AWD are a little better than the Adventure considering the individual rear suspensions and the engine tune-up. Overall inside and outside they are 85% the same, whether you consider the upholstery, Anthracite wheels, etc. The differences are only in the dashboard cluster and the AWD related mechanisms. I got my top specked Duster 110 ps Adventure Edition Amazon Green at Rs. 14.50 on-road Vashi New Bombay on the 11th Aug 2014 and have just completed 5000 kms on the odo. PS. This is my first ever post on Team BHP, And I am so glad to be a BHPian now. Last edited by Jaggu : 22nd October 2014 at 17:16. This machine blew me away completely !! I have to admit Duster AWD has Magic Carpet like ride quality, outstanding drivability (Innova, you're not my benchmark anymore) and a good mid & top end grunt. I just drove 250 kms from Ooty to Cochin in 2wd 85ps duster. As you may be aware roads are non existent in some parts of this stretch. Duster just blows all the bad roads away and you can maintain your speed without having to slow down. I kept thinking to myself that if a 2wd 85 PS duster is such fun on bad roads, how great the 110 4wd will be. Looking forward to getting my 4wd in Jan 2015. Here's a video i made while we were doing a review of the Duster AWD. It's more of a preview video before the review was to be launched. Was shot using the iPhone, Nikon point and shoot HD and Contour HD Cams so i could play around with camera angles and editing software. Lots to learn yet. Note: this is not part of the official review. PS: No more exciting footage available.